I see there have been lots of searches recently about the 2 bright ‘stars’ in the early morning eastern sky. The show is being put on by the planets Venus (the brighter and lower one) and Jupiter. Also in line with the two is the Pleiades open star cluster (above the 2 planets) and Aldebaran , the brightest star in Taurus (below the two planets). The two planets will spend the next few weeks close together. On the morning of July 15 a thin crescent Moon will add even more to the show. So for all of you early risers out there who have been watching these two, congratulations. As for the rest of us (myself included), set your clocks for an hour before sunrise, find a clear view of the eastern horizon and enjoy the show. 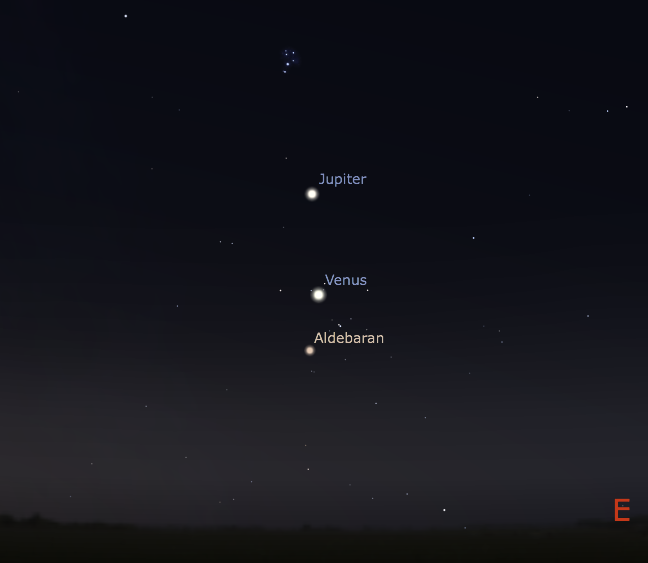 A chart of Venus and Jupiter an hour or so before sunrise on the morning of 2012 June 30. Credit: Carl Hergenrother/Stellarium. caught the early morning view from southcentral Iowa…wasnt sure what I was looking at until now?! Cant wait till the cresent moon adds to the show! Awwwwwesome! Was ther an actual occultation, or just a graze? Jupiter was literally touching the dark limb. Now that it is August, I have watched them move further apart. What is the very bright star or planet low in the eastern sky at 5am in the morning in northern illinois September 20, 2012. It was so bright I thought it was a plane landing but it continued to rise as sunrise approached. Is it Venus or magnificent star Sirius? yeah what is that very bright star in eastern sky? saw it this morning at 6am walking out in outskirts of amsterdam..